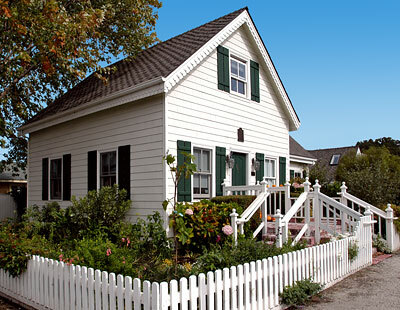 The William Adam Simmons House is one of only three remaining residences constructed in Half Moon Bay during the 1860s, important period of Anglo-European settlement in San Mateo County's first major town. It is also one of only two remaining structures in Half Noon Bay to employ wooden slab wall construction. William Adam Simmons was Half Moon Bay's first undertaker. His son, Frederick Allen Simmons, served as Half Moon Bay constable and deputy sheriff for forty years. Both father and son occupied the Simmons family residence during the productive years of their lives. All physical changes that have been made over time to the Simmons property are the product of one family in its evolution and growth. Half Moon Bay was originally known as San Benito. Much of the town we know today was developed on the Mexican land grant, Rancho Arroyo de los Pilarcitos, awarded to Candelario Miramontes in 1841. Miramontes, a soldier at the Presidio of San Francisco was the first Mexican citizen to occupy the area. He constructed an adobe dwelling on the south bank of Pilarcitos Creek for his large family and with thirty head of cattle and horses began cultivating five acres of land. During the War with Mexico between 1846-1848, a number of Spanish speaking families from Verb a Buena and Mission Dolores sought the relative isolation of the San Mateo County coastside to avoid the conflict. With the ensuing Gold Rush, others moved to San Benito to get away from the influx of Anglo/European settlers. By the mid-1850s when the extranjeros or forigners found the fertile coastal terraces, the settlement of San Benito consisted of about seven adobe homes, none of which remain today. Candelario Miramontes died in 1846. By 1853 his heirs began selling parcels from the original grant to the newcomers. The first San Mateo County tax assessment records in 1857 show native Caiifornians and the "foreigners" matched at nineteen each. By that time, San Benito had given way to the name Spanishtown, indicative of the original ethnic makeup of the population. The Anglo/European arrivals purchased or leased farming land in and around the settlement and began to build up the commercial and industrial base of the community. In 1863 Estanislao Zaballa surveyed and layed out the Spanishtown Plat, creating a gridiron pattern on the land in the tradition of American town planning that remains today. In spite of major difficulties in transporting produce to market because of the rugged physical location of the region, Spanishtown flourished and grew. The 1870 census showed Spanishtown to be the most populous township in San Mateo County. In 1874, the town's name was officially changed for the last time to Half Moon Bay. By that time there was a full compliment of general stores, hotels, and saloons a lumber yard, flour mill, wagon & plow manufacturing facilities, blacksmith shops, a brewery and churches. It was in this period that William Adam Simmons arrived in Half Moon Bay in 1864. Simmons was a native of New York State where he was born in 1838. He came to California by way of the Isthmus of Panama. Early census records show him as a carpenter by trade. San Mateo County assessment files indicate that he purchased 50 acres of land near Half Moon Bay where he engaged in farming. In 1865 he constructed the house at 751 Kelly Street. How long Simmons continued to farm is unknown, but with the rapid development of Half Moon Bay his skills as a carpenter soon came into demand. The only other identified builder in the l860's was J.W. Dawson.